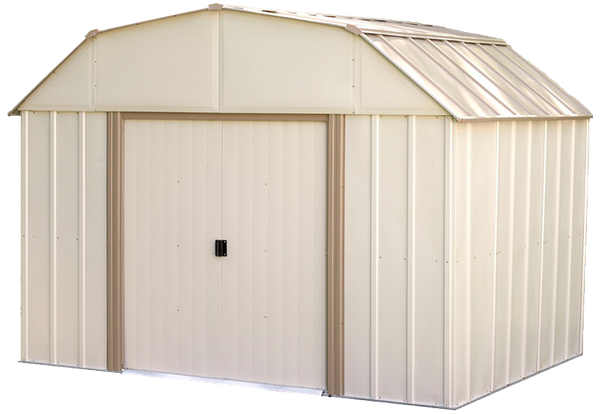 Arrow Group Industries produces a complete line of backyard metal storage sheds made of hot dipped North American galvanized steel. 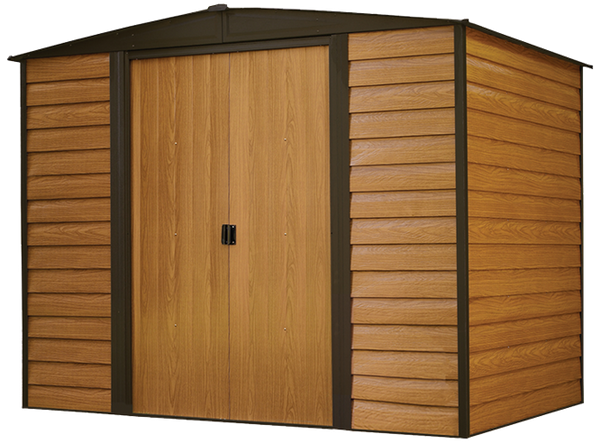 Arrow sheds have been offering the ultimate in strength and durability for almost 50 years! 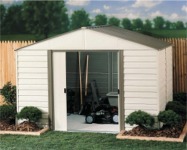 Easy to assemble do it yourself kits in a quality selection for building a backyard storage shed. 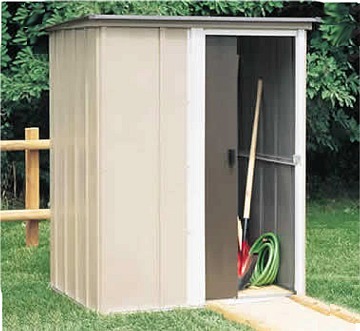 Your outdoor storage solution can be found here. 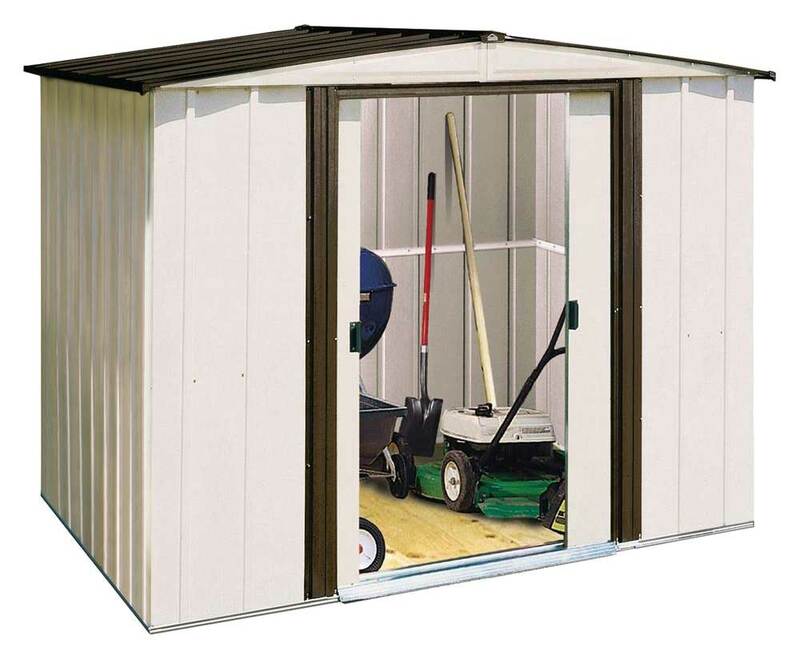 We offer a variety of lawn and garden storage buildings that are the ultimate in affordability and lasting quality. 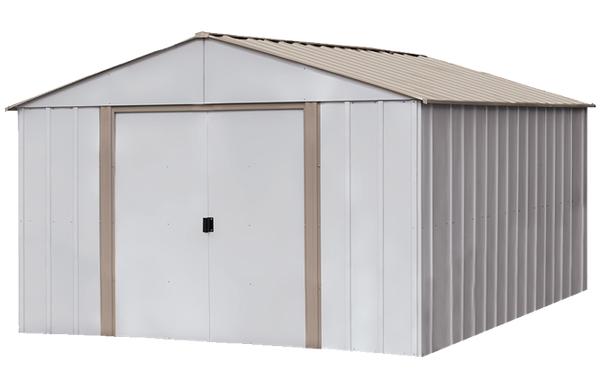 The full line of sheds by Arrow is only a click away. Years of maintenance free, strength and beauty in a do it yourself kit. 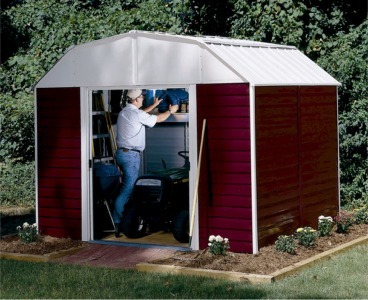 These galvanized steel backyard sheds come with full instructions and pre-drilled / numbered parts for easy assembly. 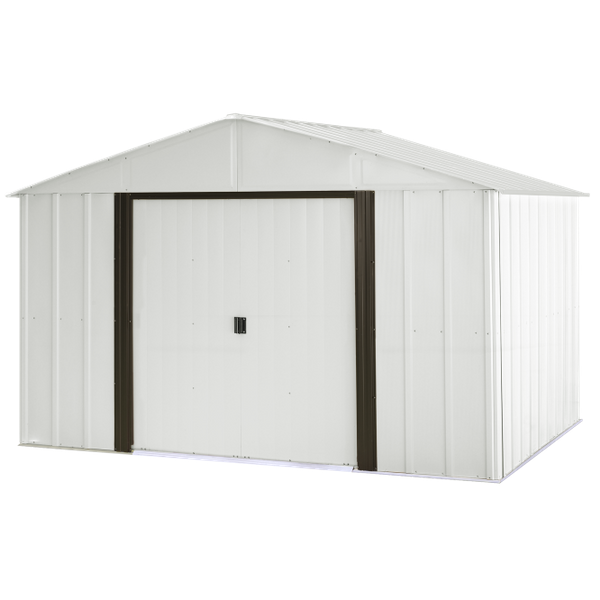 Great storage sheds at great prices, shipped directly from the manufacturer to you. 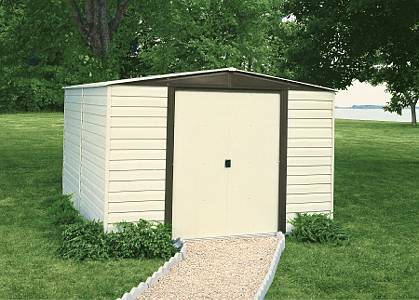 Why should I purchase a metal storage building? 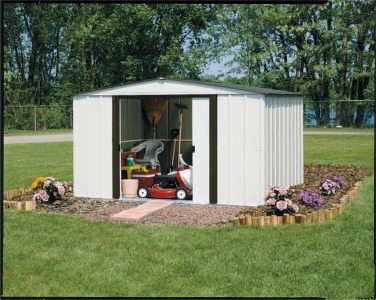 Metal storage buildings are the most economical form of storage compared to wood, plastic, and monthly rent. What tools do I need to assemble the building? A #2 Phillips screwdriver, a pair of pliers, work gloves, and a stepladder. However, a magnetic tip cordless screwdriver will speed up assembly time by 40%. Two people are also recommended and do not assemble the building on a windy day. What kind of foundation do I use? 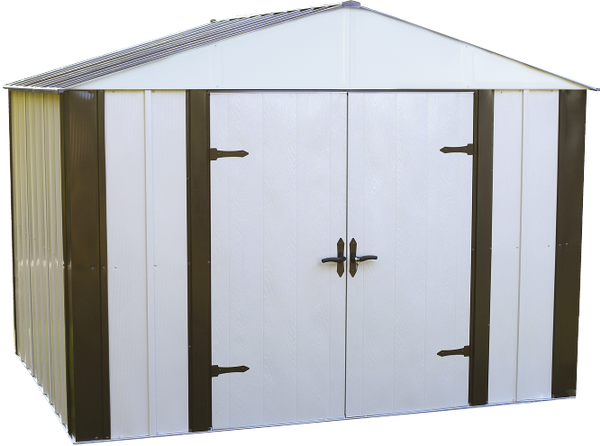 The key to a successful installation is to make sure the building is assembled on a square and level surface. You have three choices - pour a concrete slab, build a wood deck/floor, or use our Foundation Kit, which is self-squaring and helps level the building. Do I need to anchor my building? Yes! 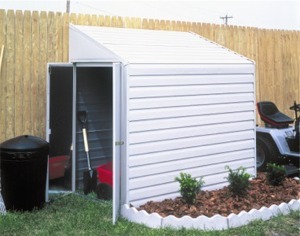 Your storage building must be anchored to prevent possible wind damage. We offer a ground anchor kit (AK4), which has 4 heavy-duty ground augers, cable, and clamps. Also available is an AK100 concrete anchor kit. Each part is identified with a factory number. The instructions contain a drawing and an assembly illustration of each step. Read the manual before beginning. Call us at 1.800.922.4760 if a part is missing or damaged. It is very helpful to completely unpack the shipping carton and lay out all the parts for easy identification. Are all supplies and parts included in the carton? Can the building be painted? The buildings can be painted with an exterior grade paint designed for use on metal. What is meant by nominal size? 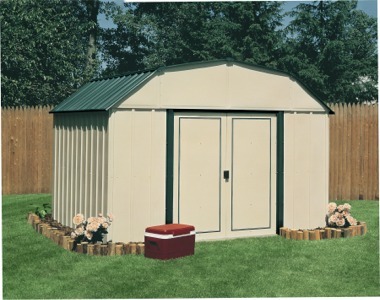 Nominal size is the roof edge dimensions rounded to the nearest foot. Always check the interior dimensions and recommended foundation size as these are smaller than the nominal size. How long will it take to assemble the building? There are too many variables which make it difficult to calculate the amount of time needed to assemble the building. However, you should plan to devote a full day with another person as a helper to assemble the building after you have selected and constructed the foundation.